Each autumn my father, in his sixties and ever keen for an adventure, comes out to visit. This year it happily coincided with Lowe Alpine asking me to shoot some images for the upcoming pack range. Here are a few images from behind the scenes, for the rest we’ll have to wait until spring! 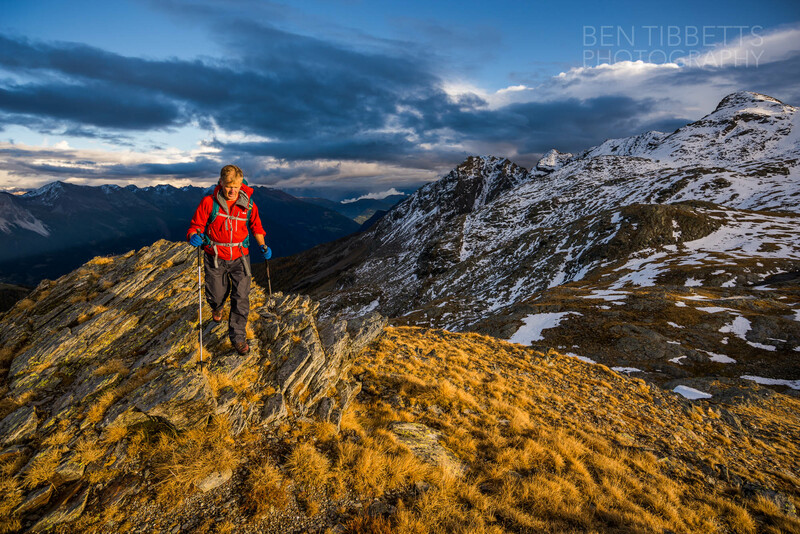 Each trip my father and I usually head out to explore some corner of the Alps I havn’t visited before. It is both adventure and research. My father has spent much if his life working in the woods and so we each see very different aspects of the landscape. We went to an area of Northern Italy not too far from Piz Bernini. As each season comes around I somehow feel that it must be the best time of year right now. I find even the idea of going exploring to be refreshing. 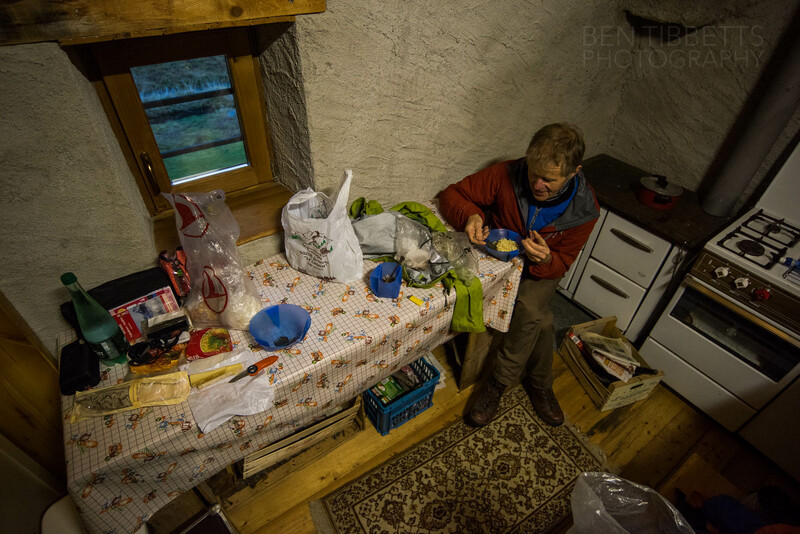 Riffling through maps, planning routes, cols and nights in remote refuges. 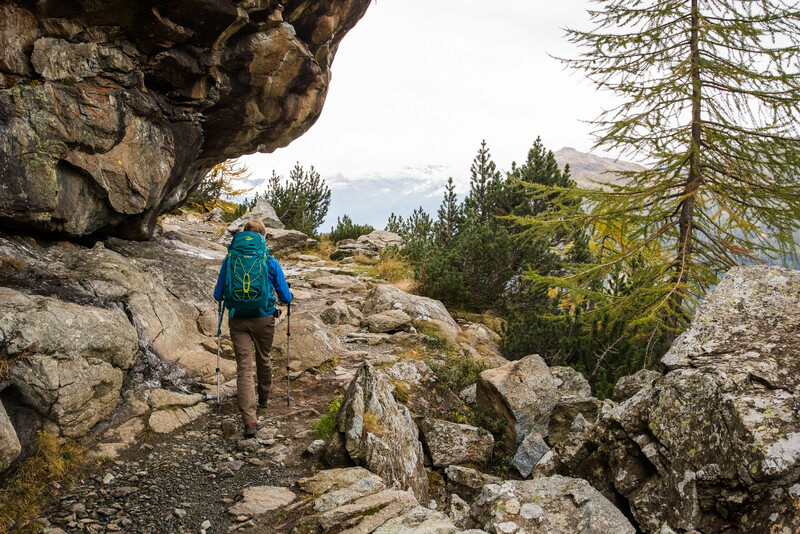 It is easy to think that the Alps are so worn into the groove of tourism that no wilderness can be found. 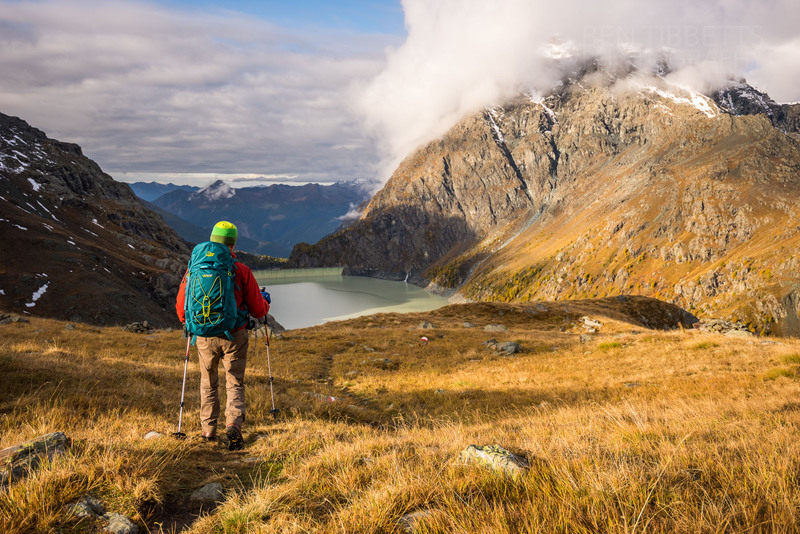 One only has to explore them on skis in the winter when all civilization is hidden under the snows, or stride out in the autumn, to find enormous tracts of land can be traversed with little contact with the trappings of society. 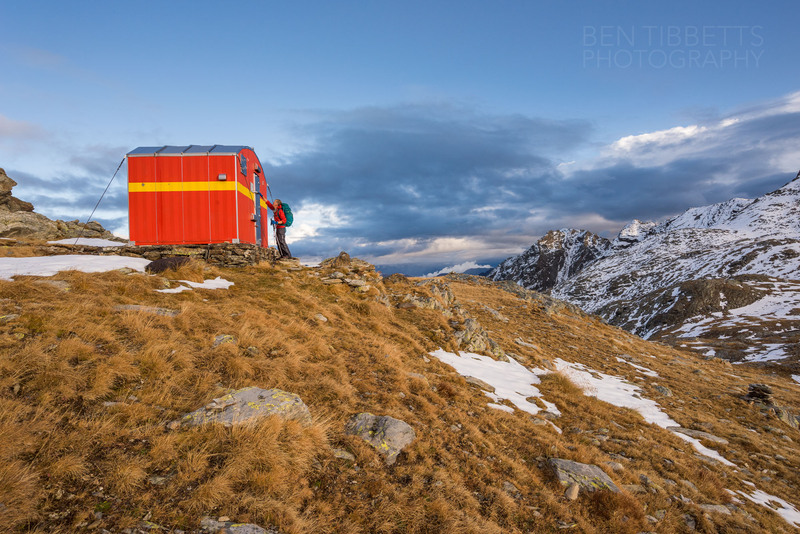 Though much of the landscape is busy with hikers and climbers throughout the summer months only a few venture out in the Alpine hills later after September. Though the valley hardwoods have only just begun to turn, the frosts have already touched the high pastures and the top of the tree line. 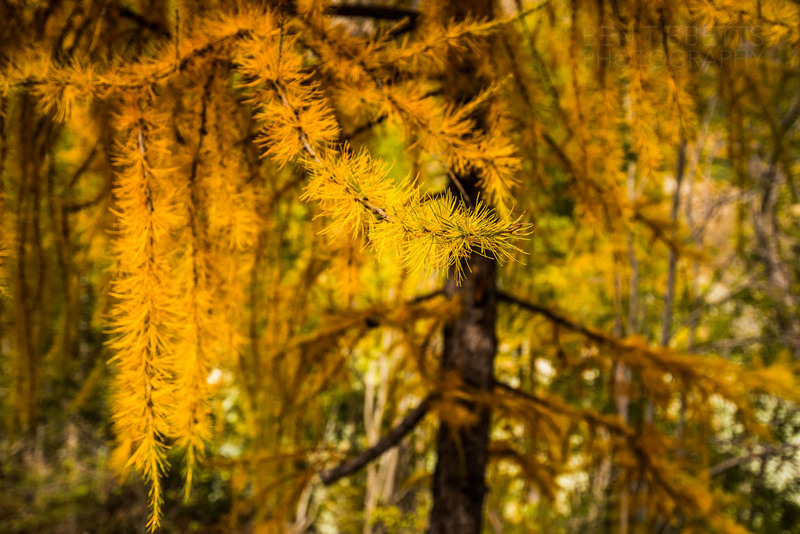 The larch needles have already warmed to a fiery orange and are ready for a gusty storm to scatter their colour. When meandering in the mountains, without specific routes or objectives in mind, the anticipation of each horizon fills me with a rush of quiet euphoria. I savour each revelation as the landscape unfolds. This provides a rhythm to these mountain days. It turns the activity into a story. As I walked under some low branches they caressed my shoulder, covering me in needles and filled the open camera bag at my waist. 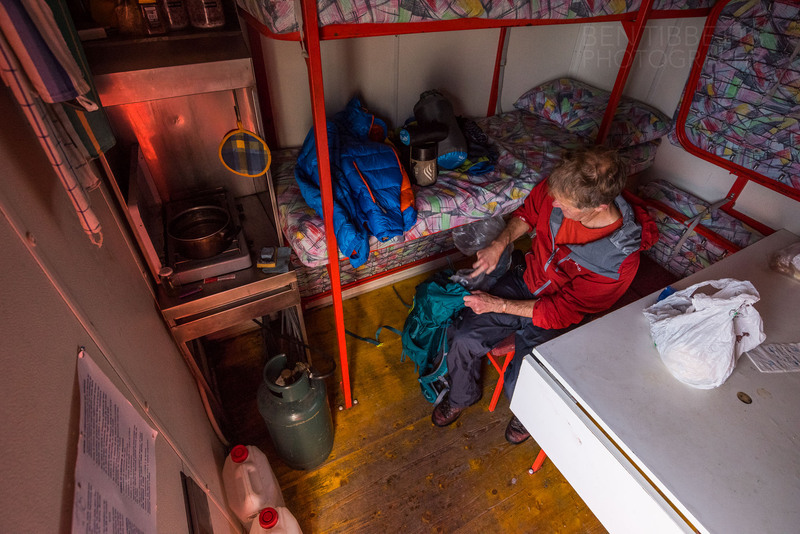 All the Swiss and French national Alpine Club huts and refuges I have visited have had a ‘winter room’, a place to stay when the guardian isn’t there and the hut is largely closed. In Italy this seems a little more irregular. The weather forecast in the western Alps for this week was atrocious, with repeated bands of weather from the northwest. We had opted to drive 5 hours east across northern Italy to outflank the worst of it. 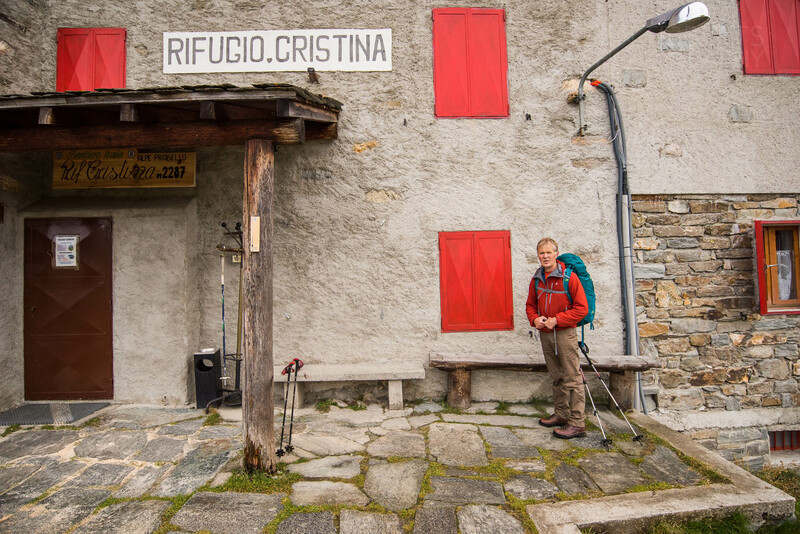 My Italian is very poor and I had failed to find out conclusively whether the Rifugio Cristina, high above Valmalenco would have a winter room. The rain tapped politely on the tin roof. The beams were the full round lengths of a mature larch trunk, each over a foot thick and vastly oversized for stature of the small cabin. The blankets had that characteristic itch, and the pillows have a mild odour of disuse, or maybe overuse. 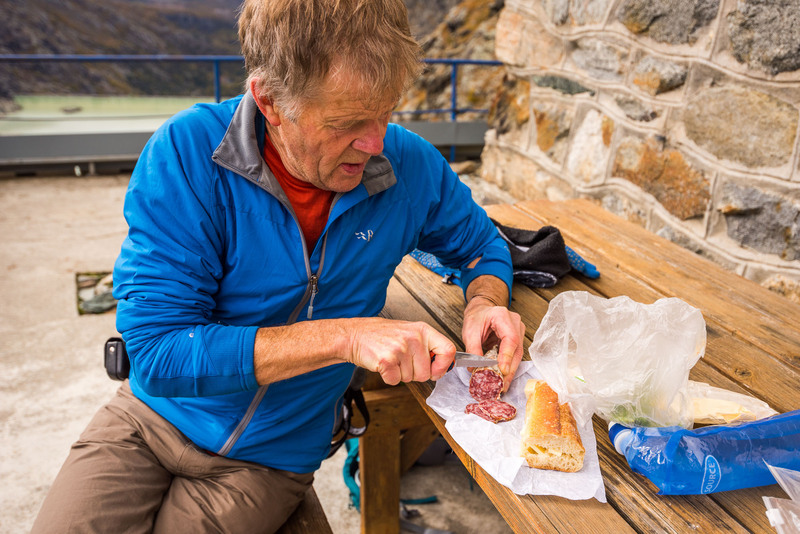 Even mildew and the passage of innumerable bodies somehow takes on a comforting aspect when one has taken a good walk and carried provisions up the mountain. This was nevertheless luxurious and homely compared to the tin shed bivouac hut (Bivacco Anghilero) of the following night. At 11pm the rain restarted with renewed faith and vigour, sent to cleanse. I was happy to be in a building rather than a tent, hearing the water running off the roof into what sounded like a moat forming around us. Even working in the mountains can feel a little hectic. I guess everything is relative to ones expectations… This is not a metropolitan hectic, but a mountain hectic where everyone is trying to squeeze as much fun into their days as possible. The pace of things usually carries me along until my body crashes with fatigue and the summer season runs itself out. 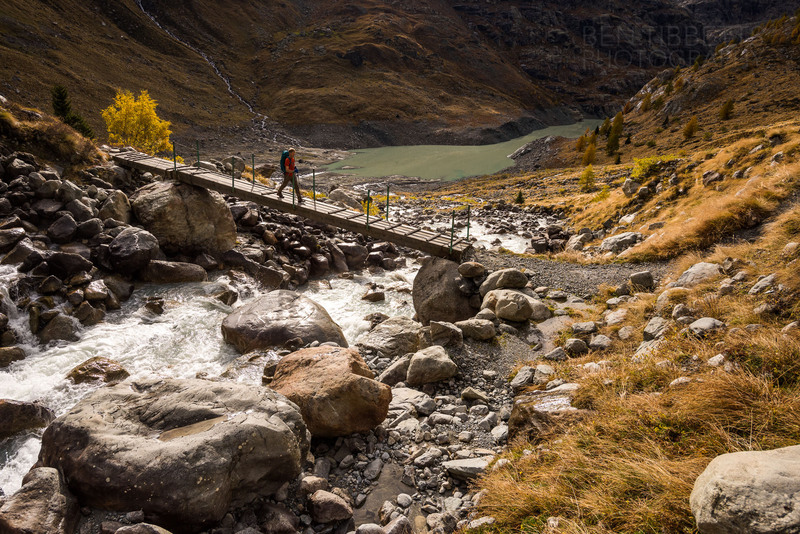 The autumn in the Alps however rarely gets hectic. I treat it as a time of recovery and taking stock of the year, maybe a little like people greet New Year after the excesses of the festive season! The rainy days feel like great excuses to laze around the house. The valley smells rich with moist wood, mulching leaves and fungi. The snow advances down the mountainsides in fits and starts, refreshing the clear lines of the high mountains. 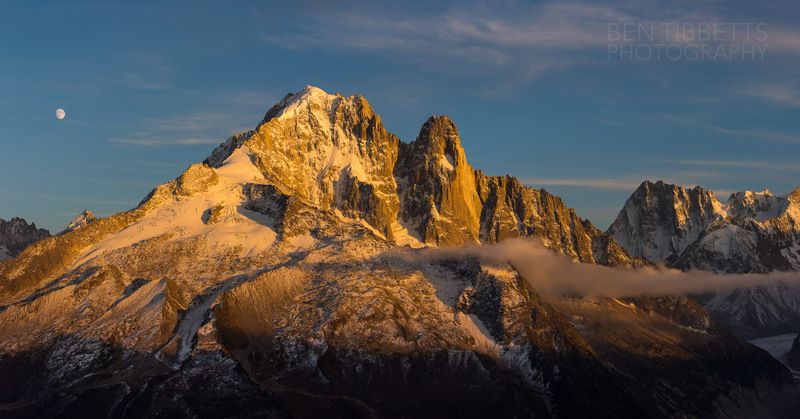 Aiguille Verte, Chamonix, at sunset – a photo I had recently taken after a fresh snowfall. With each snowfall a new high water mark is drawn across the landscape, valley after valley. The lines are clear, like a statement of intent. The changing colours and softening light seduce me out to chase the morning light and search for new angles on these well visited and well photographed landscapes. 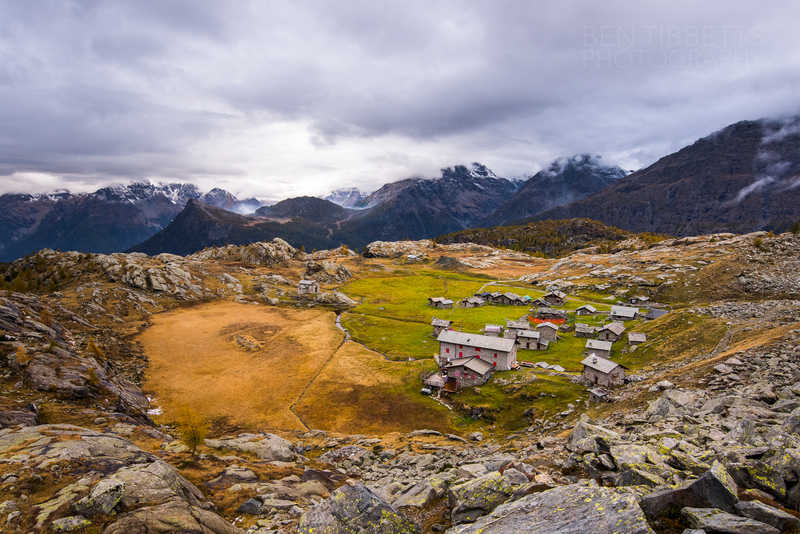 The changing of the seasons are keenly felt in the alps. Not quite like the apocalyptic changes that one experiences in the autumn in polar regions. Nevertheless as the sun turns a lower arc the warmth leaches back out of the rocks. Heading from summer into autumn both the climate and vibe of the mountains turn over together. In early September all the bustle of tourism mysteriously vanishes and one by one the refuges close, the trade extinguished and the guardians descend to the valley. As the traditional Alpine season is over I revel in the spaciousness of the landscape. As most refuges leave a room open with bedding, or even a stove and fuel, one can rarely go wanting for a roof over ones head. 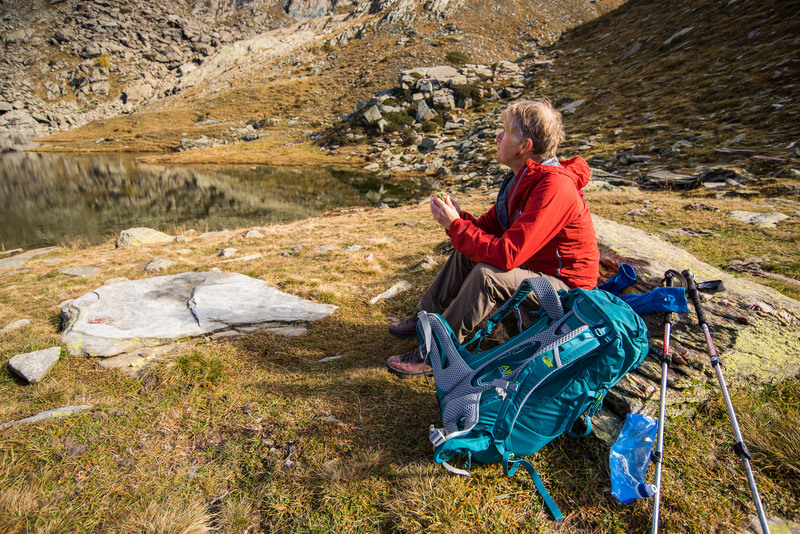 Should you be so lucky as to find an area with no refuge a tent brings even greater freedom. With no set itinerary it is a quiet time of year to meander between one resting place and another. I always wonder why everyone takes their holidays at the same time – do we all prefer to climb together and on top of each other? 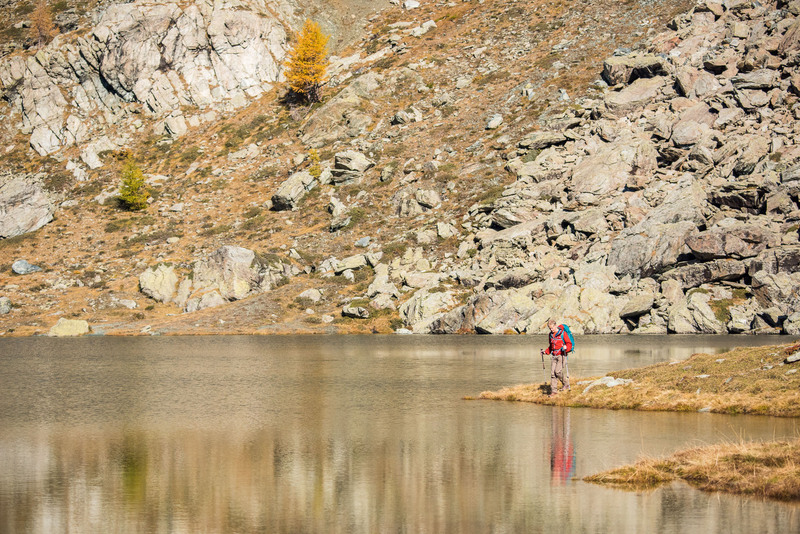 There is plenty to do at all altitudes in autumn. However given the weather is often a little unsettled and many refuges are closed more thought and planning is required. In the high mountains the snowline leaps and bounds back down the slopes, only to retreat and start once again. Often this gives great climbing conditions on the big Alpine faces, and beautiful landscapes to appreciate on foot. I think it is the perfect time of year to just wander about the mountains with no fixed objective.